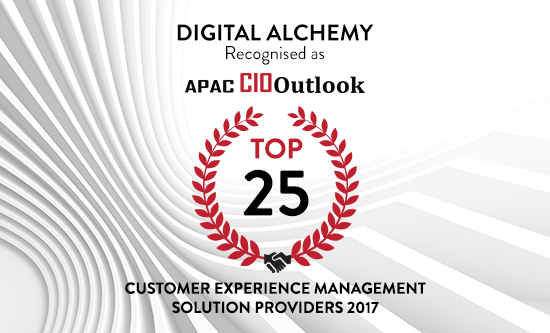 We’re very honoured to be named as one of the “Top 25 Customer Experience Management Solutions Providers 2017” by APAC CIO Outlook. APAC CIO Outlook analysed over 800 providers offering Customer Experience Management (CEM) solutions in the Asia Pacific region. The magazine selected the top 25 companies that provide best-in-class CEM solutions for optimal outcomes in regards to delivering customer value and we’re proud Digital Alchemy is one of them. With offices across major cities in Asia Pacific, we’re excited to continue to enable dynamic decisioning to help drive relevant, timely communications to consumers around the world. The full article on Digital Alchemy’s selection can be found here.